Andy Hall captures his skillful bluegrass playing in this extensive library of Dobro & lap steel lessons. Students in the Dobro course have access to video lessons, guitar tabs, backing tracks and more. 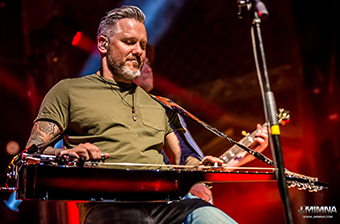 Learn how to play lap steel and Dobro from a bluegrass master. What ultimately sets these Dobro lessons online apart from other offerings is the ability to submit a video for review using the ArtistWorks Video Exchange Learning® platform. Andy reviews each submission and records a video response, offering specific guidance to take your Dobro playing to the next level. All students can access the Video Exchange library and watch each other’s interactions with Andy. This library is constantly expanding and may contain the key to unlock your playing. Andy Hall graduated from the Berklee College of Music in Boston, MA with a degree in Music Production and Engineering. Andy is a founding member of the acclaimed band, The Infamous Stringdusters, who in 2007 won 3 IBMA awards for their debut album, Fork In The Road. He has also released 3 albums of his own: Aquafier (2010), The Sound Of The Slide Guitar (2007), and Redwing (2004). Andy has played Dobro with many legends in the studio and on stage with Dolly Parton, Earl Scruggs, Emmylou Harris, Zack Brown, Charlie Daniels. Andy brings forth a new generation attitude and remarkable passion toward the traditional Dobro guitar in the online lessons at ArtistWorks. Ear Training Exercise 1 -NEW! “In the Sweet By and By” -NEW! “Keep On The Sunny Side” -NEW! Ear Training Exercise 2 -NEW! "May The Circle Be Unbroken"
“You Can't Stop the Changes” -NEW! Andy's Lap Steel Setup -NEW! Incredibly helpful, abundant, user-friendly... and constantly inspiring. Having never played a Musical Instrument in my Life I decided to learn the Dobro, mainly because of it's unique sound. I'm about 4 months into lessons with Andy Hall and even -though I have a long way to go.' I'm surprised with the result. Thanks Andy. Artistworks is really awsome for learn, whatever your level. The videos exchanges are a great chance for having usefull feedback of the teacher. Top of learning an instrument!